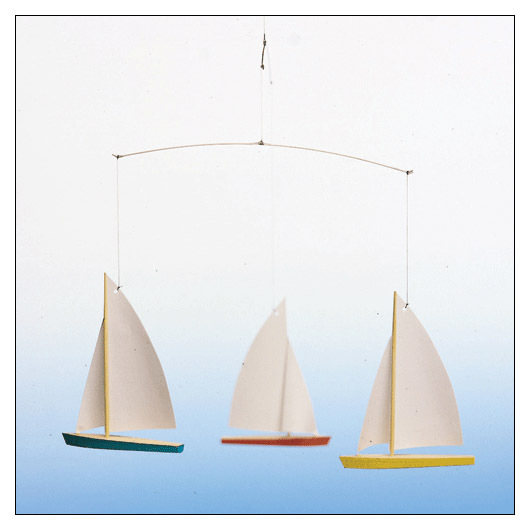 Flensted Dinghy Regatta Mobile - 3 Ships (msfmdinghy) at Pure Design / Accessories / Flensted Mobiles ::: Furniture for the Home, Office, Home Office, and More at Pure Design Online! Time to set sail! Mini can now watch 3 boats in constant motion with the dinghy regatta mobile. If you have the love for the sea and water, this mobile is a sure win. Flensted Mobiles are created so that the elements are in constant motion while the entire mobile maintains a harmonic balance. Each mobile is carefully assembled, and balanced by skillful hands. They are packed so that they are ready to hang.